CSP & I were at Lowe’s the other day and I snuck a hummingbird feeder into the buggy. He didn’t think it was going to work. That I’d fill it up with nectar and it would sit lonely in the back yard. Within 24 hours 3 hummingbirds had declared our feeder to be their new nectar joint! Yay! I hung it on a shepherd’s hook. Since it drew a small crowd CSP was on board with adding another feeder to the other side of the hook. One of the male hummers is a little territorial and he’d been running some birds off from the feeder. We thought 2 would make it easier on him. By the way, CSP named them Hector, Heather & Pat. Pat because we can’t tell if one is a girl or boy. We set up the feeder so we can watch them from inside the screened porch. I’ll try and get pics soon. They are so fast! Anyway, back to Lowe’s we go. On the way we saw a Walmart truck & CSP remarked that it must be lost as there weren’t any Walmarts where we were. Or so we thought! They had built a new Walmart seemingly overnight without us knowing a thing about it. So we decided to check it out and see if they had hummingbird feeders there. 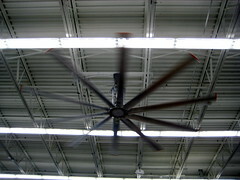 We went in through the lawn & garden section and they had these ginormous fans! Gale force winds! I’ve never seen anything like it! This Walmart was clean, had nice people, and I didn’t see a single child getting beat like we usually do. They also had a better hummingbird feeder. One with a perch going all the way around it and it was only $3.88. We might actually return! Sounds cool! Might have to pick up a hummigbird feeder for our yard! You totally should! We love watching them! Plus, it’s so cheap- just sugar water! Once they get comfy I’m gonna see can I hand feed them. I can’t wait to see the hummingbird pictures! !